Man, remember the playgrounds we grew up with? Sharp slides that cooked in the sun and then grilled your legs if you slid down while wearing shorts? Bouncy metal animals that tossed you to the ground? Merry-go-rounds that made you barf? Today, it seems like all the playground equipment has been bubble-wrapped. It's safe and colorful and you'd have to really try to hurt yourself on it. We also had the swinging horse thing shown in the middle of this page at our park. Way better than regular swings! I also loved the comments in this Ask Metafilter thread about the site. Spend some time with it if you can -- the readers provide way more links to great playground photos, and all are awesome. 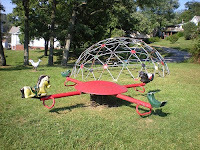 Plus how else would I have learned about Playscapes, a playground-design blog? Genius! Won't you reminisce with us about your fave playground equipment in the comments? The all time best piece of play ground equipment at my grade school was a horizontal metal bar. That's it. It was set into the ground and stood a little above waist-high for us. You stood in line and were allowed three "tricks" each turn. This usually consisted of swinging upside down, back and forth, by your knees and then releasing yourself and landing on your feet. You could also do the "dead man's drop" where you sat on the bar and flung yourself backwards, hooked yourself by your knees then threw yourself off and landed on your feet. Best thing ever!!!! OMG such good times.